Congratulations to Jyotishman Dasgupta and his group members for recognition of their research efforts! "Towards tracking long-lived charge transfer dynamics in non-parallel stacks of donor and acceptor chromophores"
"Probing The Excited State Dynamics of all-trans-Lycopene Aggregates: A Transient Pump-Probe Spectroscopic Study"
3. Sunandita Paul won the inaugural Mihir Chowdhury Fellowship award and was adjuged the TOP poster presenter in FCS2018 held at JNU and IIT Delhi this November. As part of the award Sunandita received a Rs 1 lakh travel grant to attend conferences of her choice anywhere in the world. Her poster was titled: "Towards light-induced carbocation generation in a supramolecular cavity"
4. Arup Kundu won one of the 5 best poster awards at FCS2018 held at JNU and IIT Delhi this November. His poster was titled:"Probing The Excited State Dynamics of all-trans-Lycopene Aggregates: A Transient Pump-Probe Spectroscopic Study"
5. Jyotishman Dasgupta received the Best Young Investigator Award from the 2018 Chemistry of Materials meeting held in Kovalam Kerala. Mr. Rustam Singh received best poster award in 4th International Conference on Advanced Nanomaterial and Nanotechnology (ICANN-2015), one of the best nano-conference in India, organized by IIT, Guwahati during Dec 8-11, 2015. Mr. Rustam Singh received best poster award in ICONSAT 2016 organized by IISER, Pune and DST, Nanomission. He presented his recent work on, "TiO2 coated KCC-1 for photocatalysis: Nanoparticle formation and quantum confinement". Dr. Polshettiwar is recognized as one of the 'Emerging Investigators 2016' for Novel design strategies for new functional materials by Journal of Materials Chemistry A of Royal Society of Chemistry, UK. Dr. Polshettiwar has been awarded prestigious "Bronze Medal" by Chemical Research Society of India (CRSI) for 2017. 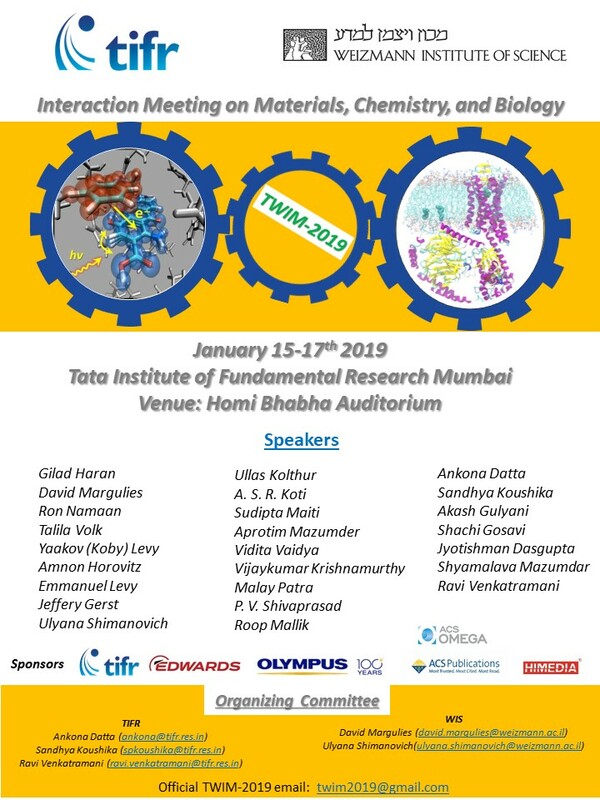 TIFR research scholars and staff have consistently garnered accolades at both international and national meetings. Congratulations on their latest achievements! Mr. Chandansive Balasaheb B. won the 3rd spot in the best oral presentation award at the International Conference On Nanomaterials and Nanotechnology (Nano 2015) held during Dec 7-10th at Trichengode,Tamil Nadu. The title of his talk was: "Hydroxyapaptite Nanotubes: Biocompatible and Internalization Study". Click here for pics! Read more about research in the Khushalani lab here. Dr. Ankona Datta`s group has recently featured in the ACS Emerging Investigators in Bioinorganic Chemistry. Congratulations to Ankona and her group members! Read the full article here. Samsuzzoha Mondal, Ph.D. Scholar from Ankona Datta`s research group, won the RSC Best poster award at the 6th International Conference on Metals in Genetics, Chemical Biology, and Therapeutics held at I.I.Sc. Bangalore, February 17-20, 2016. Samsuzzoha`s poster was titled: "Sensing Signaling Phospholipids with ‘Turn on’ and Ratiometric Fluorescent Probes". Congrats Samsuzzoha! Anindita Sarkar, Ph.D. Scholar from Ankona Datta`s research group, won the best poster award in the international conference on Optics Within Life Sciences (OWLS-2016) held at TIFR during March 16-19. Anindita`s poster was titled: 'Turn-on' Fluorescence Sensors for Imaging Mn(II) in Live Cells'. Congrats Anindita! Ankona`s research group works in the areas of Chemical Biology and Synthetic Chemistry, Molecular Biophysics and Imaging, and Bioinorganic and Biomimetic Chemistry within the department. Click here to learn more about Ankona`s research program. Prof. Sudipta Maiti`s research group has reported exciting progress towards identifying the structure of the oligomeric form of amyloid beta, the toxic molecular species that causes Alzheimer`s disease. The full research article has been published in ACS Nano. The ASAP article link is here. The breakthrough has received media coverage. A clipping can be found here. Vivek`s research group is part of the nanoscience and catalysis program in the department. Click here to learn more about Vivek`s research program. Dr. Vivek Polshettiwar is now a fellow of the Royal Society of Chemistry, UK. Congratulations to Vivek!